Picture the scene: conditions are perfect, with flat seas and a clear blue sky. The atmosphere on the small boat is thick with testosterone and there is much whooping and hollering and backslapping as the six divers prepare their gear. The gauntlet has been thrown down. The challenge: to descend quickly down a reef wall to 90m on a single cylinder of air, collect a handful of sand and then come back to the surface. The two individuals accepting the challenge are young, physically fit, good swimmers and experienced divers. It is an initiation ceremony; the other guys on board have all completed the task previously and earned their “wings”. They are here today to cheer the new boys on. The six divers enter the water together and all descend to 40m where the four “veterans” stop and watch the other two continue on down. At first, all they can see are two streams of bubbles, and then the two streams become one. Then the bubbles stop. They wait. Time passes. They wait a little longer. After 15 minutes with no sign of their missing buddies, concern turns into full-blown anxiety. They separate: two of the team head for the surface to run a boat search; the others stay underwater, peering down into the blue desperately hoping for a miracle—but to no avail, the two divers are never seen again. Every year, people die diving deep on air. Many of the victims are expert divers; some are even professionals. The scuba training agencies set depth limits for both no decompression diving and planned decompression diving on air, but many interpret these limits as just well intentioned advice that might apply to beginners but certainly doesn’t apply to divers with their years of experience. So, while they may pass the warnings on faithfully to others, when they dive themselves, they do not practice what they preach and exceed the limits, often with tragic consequences. These divers are ignoring a basic truth. Surviving ultra deep dives on air has nothing to do with experience, competence or courage. The reasons that diving deep on air is so dangerous are all bound up with human physiology itself and none of us can beat that. None of us is super-human! The problem with deep air diving is not the “deep” word. Diving deep is fine, as long as you have the right experience, the right equipment, the right training and, most of all, the right gases. The problem is the “air” word and what happens to your body and mind when you breathe air underwater. There are four major issues, which can combine to cause deep divers insurmountable difficulties. What are the problems with air? First, air contains oxygen, a gas that we need to sustain life. However, if we consume it in too large a dose, oxygen can cause disabling convulsions. These can lead to drowning if they occur underwater because affected divers cannot control themselves or their equipment while the convulsions are taking place. At the surface, the air we breathe is completely safe, but when we breathe air on scuba below 50m or so, we start to push the upper limits of the dose of oxygen that a swimming diver can breathe safely, and there is a real risk of oxygen-induced convulsions. The second issue with air is that it is dense and, like all gasses, it becomes denser as its pressure increases. Therefore, the deeper we dive, the denser the air becomes and the more difficult it is to breathe. When we dive, the artificial apparatus we use and the water pressure all around us already make our breathing less efficient. So when we are deep on air, it becomes harder for us to fill our lungs. More importantly, it also becomes harder to empty them between each breath. This leads to the third issue. The primary consequence of reduced breathing efficiency is that we retain more carbon dioxide (CO₂) in our lungs and bloodstream. The increased CO₂ level not only makes us more susceptible to an oxygen toxicity convulsion, it can also trigger our automatic emergency response system, the final phase of which is panic, the diver’s worst enemy. Underwater, trained deep divers with a clear head may identify the process that is causing an onset of anxiety, cease all activity and take a series of deep full breaths to reduce the CO₂ level in their bloodstream. However, the fourth and final issue means that divers breathing air at depth are unlikely to be able to exercise the clarity of thought required to resolve their predicament. The three main gasses present in our bodies when we breathe air are oxygen, CO₂ and nitrogen, all of which have something called anaesthetic potential. This means that, in sufficient quantity, each gas can knock a person out. The deeper a diver goes, the more the partial pressure of each gas increases, and the greater its anaesthetic potential becomes. This produces the phenomenon we call narcosis. The subjective symptoms of narcosis often differ, but objectively, narcosis makes us overconfident, relaxed and inattentive, which means we are unable to respond to an emergency quickly or rationally. 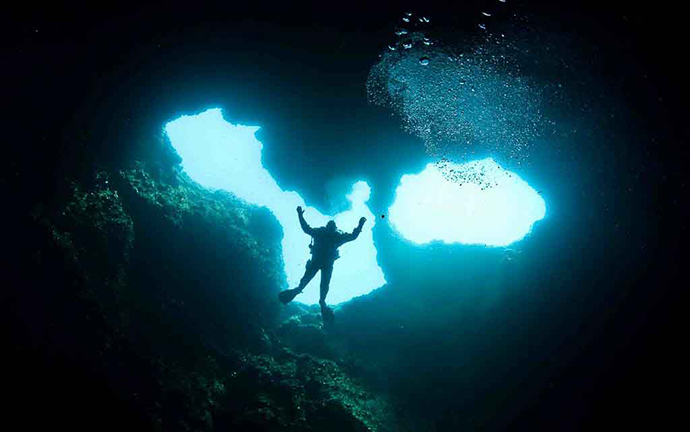 An anxious diver in the grip of narcosis is unlikely to be able to identify the body chemistry that is causing his anxiety and react correctly, leaving full-blown unreasoning panic as the inevitable consequence. So, the cumulative risks presented by these four factors—oxygen, gas density, CO₂ and narcosis— make air completely unsuitable as a deep diving gas. Simon Pridmore has been part of the scuba diving scene in Asia, Europe and the United States (well, Guam) for the past 20 years or so. His latest book, Scuba Confidential, is available in paperback, audiobook and e-book on Amazon. His new book, Scuba Professional, was releases in July 2015.